There are many things to see and do while at QSDS. In addition to our daily classes, we offer a vending area, bazaar, field trips and social events. QSDS provides a one-of-a-kind free vendors' mall, open to the general public. Hours are 10 a.m.–7 p.m. each day of the symposium except Wednesday, when the mall is closed. We are a store for all your surface design and embellishment needs! 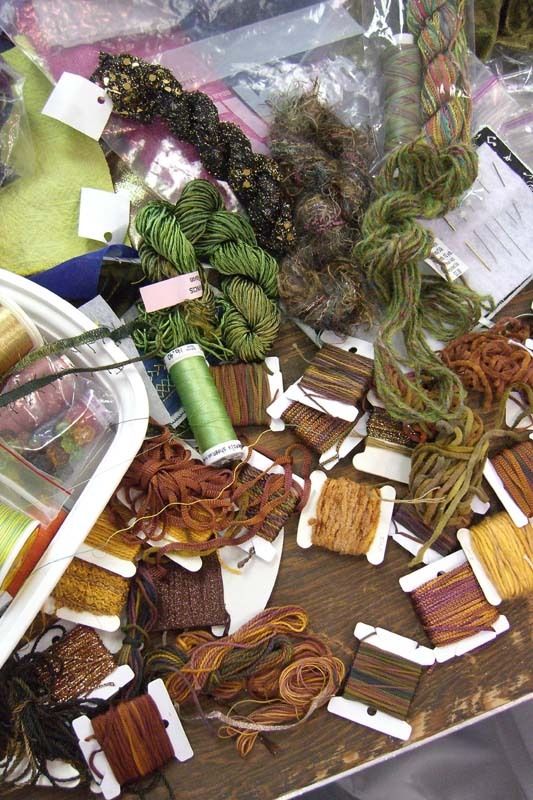 Fabrics, paints, dyes, thread, fibers, beads, buttons, stamps, embellishments, and more. The bus tour takes place on each Wednesday of QSDS after morning class and lunch. There are no guided classes that afternoon, so students will not miss important class information. Take a break from your QSDS classes, sit back and relax on a Wednesday bus tour. 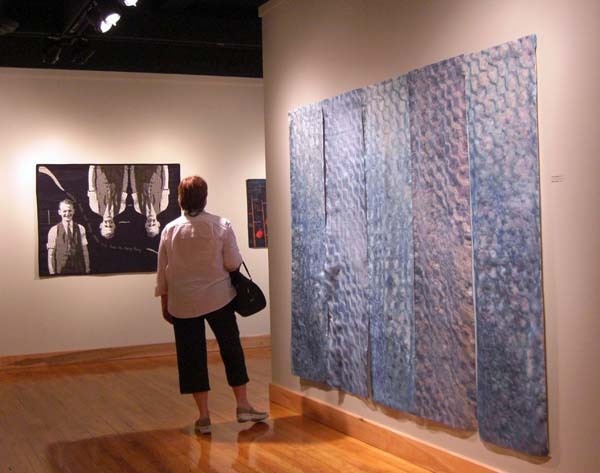 Enjoy a day of artistic influence as we visit museums and galleries, often hosting local quilt exhibitions. 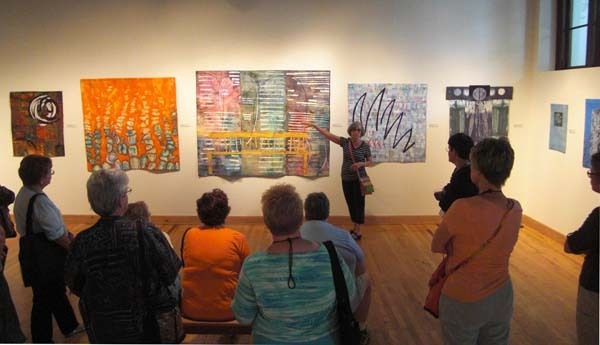 The bus tour leaves at noon and generally arrives back at CCAD at 7 p.m. Imagine artists from all over the world coming together in one place to sell their wares. Imagine being able to shop and roam from table to table, finding unique fabric for your next project or a special gift for someone. This is our weekly mini-bazaar. The mini-bazaar is held both Tuesdays of the symposium. Teachers and students at QSDS are invited to sell their handmade items or supplies at this event, which is held alongside the ice-cream social. To reserve a table and sell your work or supplies, you must first be registered for a five-day class and pay a $50 vending fee through our main registration page. This is a great way to help defray some of your expenses or earn extra fabric money. This is the only opportunity for QSDS participants to exchange and sell their work. Please note that students and teachers may not sell non-class related merchandise in the classrooms, studios, dorm or hotel rooms because it is detrimental to the vendors who rent space in the vendors' mall. The bazaar is open to the general public. Feel free to invite friends to stop by for the fun. Note: Table space is limited and vending table requests are filled on a first come, first served basis. The QSDS quilt auctions are held both Fridays of the symposium. This social affair, featuring light refreshments and drinks, is a lively celebration of the week’s events. Mini-quilts, created by symposium participants and other donors, are auctioned off at an entertaining, rapid pace. There is also a raffle featuring art supplies, handmade items, souvenirs and more. Proceeds from the auctions provide scholarships for students who otherwise could not participate in QSDS. Show your support for aspiring quilt artists by creating a 12 x 12" mini-quilt or art piece to donate to this important event. You can send your work at any time to Tracy Rieger at 2572 Tulane Ct., Lewis Center, OH 43035. Mark the outside of your package with the session you prefer for auction (Session 1 or Session 3). Auctions will take place both Fridays of QSDS at 7 p.m. in the Crane Building on the CCAD campus. 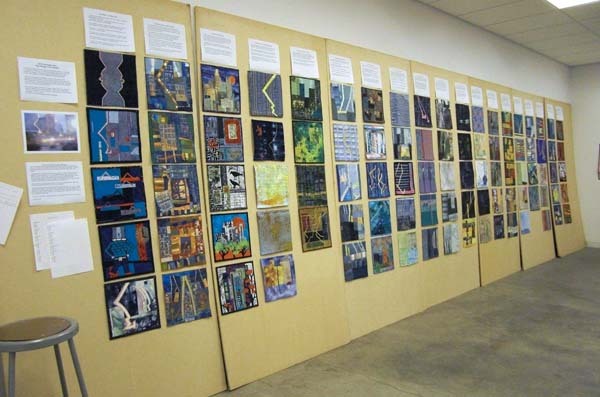 Preview the wonderful mini-quilts throughout the symposium in the Design Studios on Broad. If you have any questions, contact Tracy at tracy@qsds.com. The faculty presentations feature an overview of each instructor's current body of work. This event provides a valuable learning experience, covering a broad range of ideas and techniques. In addition, on Thursdays we host a presentation on the following year's faculty. This talk and slide show gives a visual sense of what will be offered at next year's symposium. What would happen if your quilt was damaged or lost? Would you be able to replace it with one of comparable value? Protect your quilts and quilted textiles with a written appraisal. Your art or antique quilts may be appraised for insurance value (if lost, stolen or damaged), market value (for selling purposes), or donation value. A written appraisal includes a specific description of the quilt, assessment of condition, dollar value, a photograph and instructions for use and care. Dee Dadik (certified by the American Quilter's Society) and Molly Butler (accredited member of the International Society of Appraisers) have over four combined decades of experience to help you understand your quilts’ value. They have taken classes in dating, construction, appraising, legal issues, ethics, care, preservation, social history, textile history and regional differences. This knowledge, plus an extensive library of references, helps them appraise your quilts and gives you a greater appreciation and understanding of what you own. Dee and Molly will make appointments for specific times during the symposium. Please call or e-mail in advance to make an appointment. You will be sent a pre-appraisal questionnaire to complete before your meeting. Take home a memento of your stay: an official QSDS T-shirt. Every year, Iowa fiber artist Diane Muse produces new wearable art for us. These tees are heavy-duty cotton, designed and silk-screened by Diane herself. 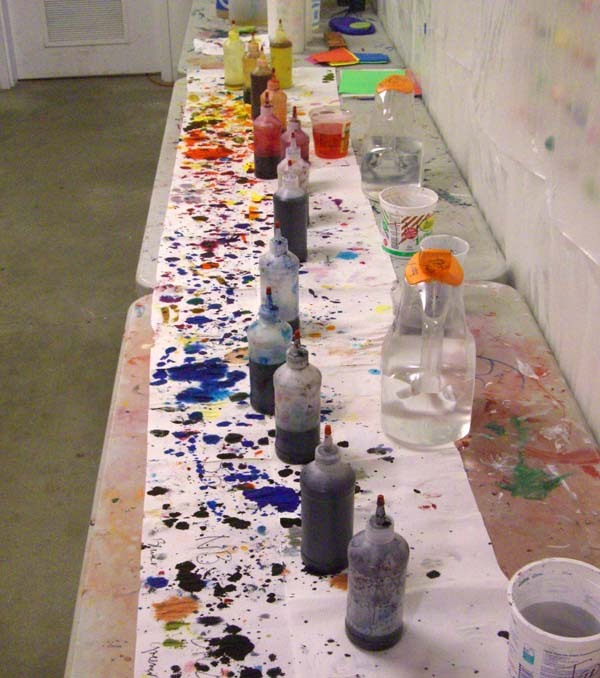 Diane's works have been highly collected since the very first symposium over two decades ago. Sizes range from small to XXL and come in men and women’s styles. Order yours ahead of time on the registration page or stop by the office once you are here and request your official tee. These shirts are only $27 and will sell out: get them while supplies last. QSDS offers an on-site massage therapist, Robbin Koenigh, LMT. She invites you to come visit her relaxing environment where you can banish your real-world stress and permit your creative process to fully engage, while ridding your body of aches and pains. Robbin offers a peaceful reprieve with soft lighting, colorful tapestries, mild scents, and music that will help carry you away. Use this time to open space in your mind and allow for a meditative and therapeutic experience. Robbin offers a variety of massage styles for 30, 60 or 90 minutes. If interested, include this service in your online registration, or sign up in the QSDS office.